We have written about Amherst’s missionaries who traveled the world, but some missionary work was done much closer to home. 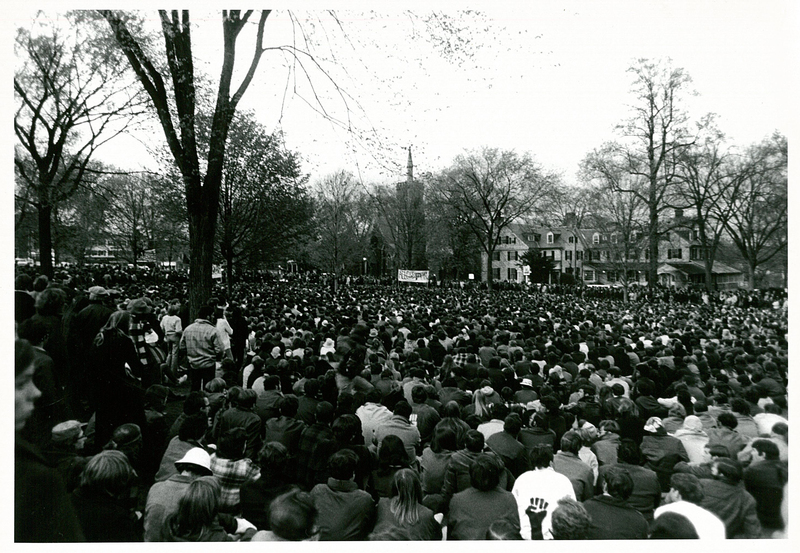 For just over forty years, Amherst students worked with Holyoke’s Rev. Dr. Edwin B. Robinson (class of 1896) at Grace Church. Holyoke was a busy manufacturing city; Grace Church was a working-class congregation located in the Flats, where tens of thousands of immigrant families worked in the paper and textile factories and lived in crowded tenements (often company-owned). Parsons Paper Mill, in Holyoke (1909), with coal smoke billowing from its chimneys. Amherst College and Western Massachusetts have experienced below-average rainfall amounts for a seventh straight month this year and as a result, water levels in town reservoirs are the lowest they have been in recent history. In mid-August, the state of Massachusetts issued a drought watch for the Connecticut River Region and the Town of Amherst has imposed mandatory water conservation measures for the town, including Amherst College campus. If you’re on campus, you’ve likely noticed these signs around encouraging conscious consumption and water conservation. 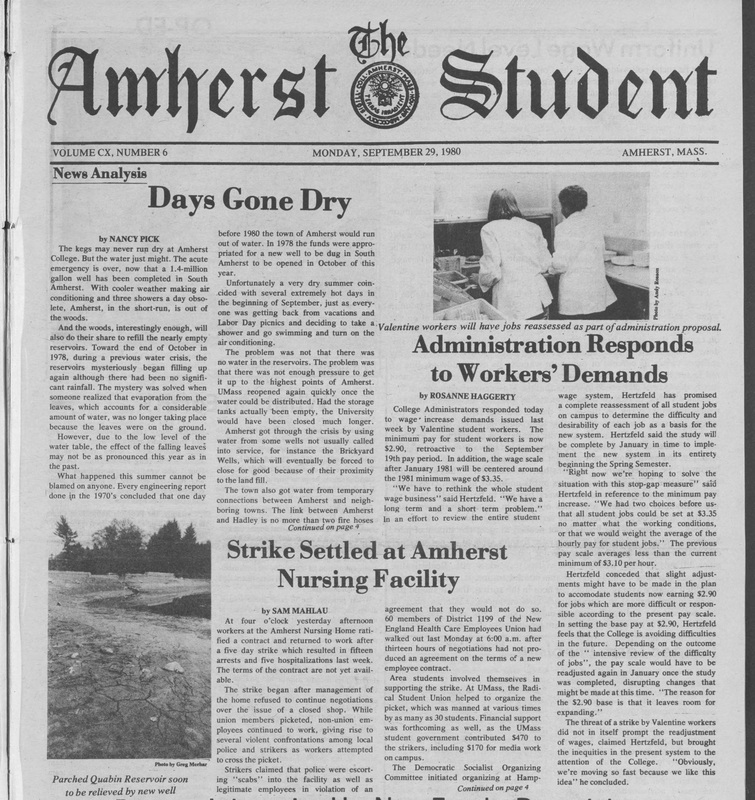 In the fall of 1980, Amherst experienced a severe water shortage due to a very dry summer, several hot days in September, an unusually light snowfall the preceding winter, and the yearly influx of many thousands of students to the area. 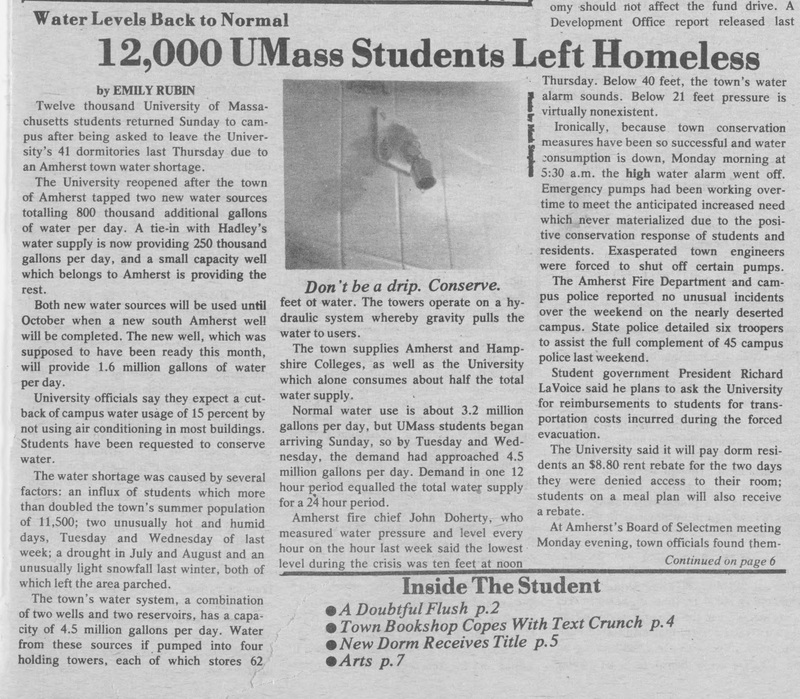 In early September, University of Massachusetts, the largest of the three colleges in Amherst, closed campus for several days as an emergency response to lessen demands on the town’s water supply. “Turn off the water when brushing teeth, washing face, and shaving. Use plugs in sink–fill the sink with hot water instead of letting the faucet run. 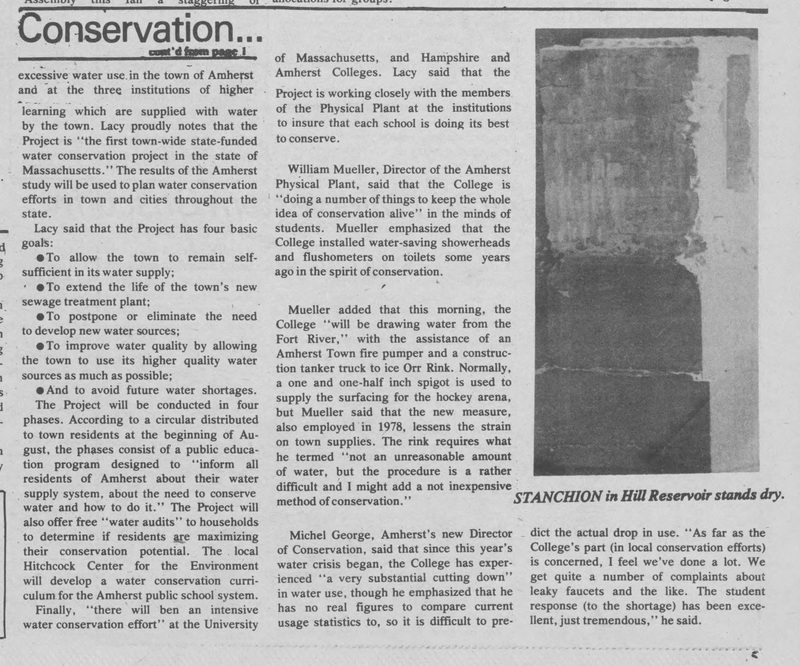 The Amherst Student reported that members of the Conservation Project were meeting with the Physical Plants at University of Massachusetts, Hampshire College, and Amherst College to ensure that each institution was doing its best to conserve water. 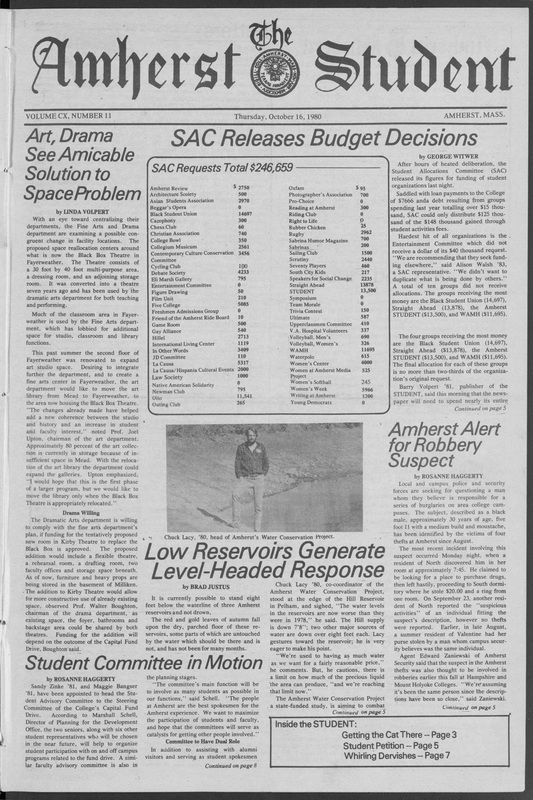 The Amherst Student gives an interesting glimpse of the 1980 town water shortage and campus-wide response. 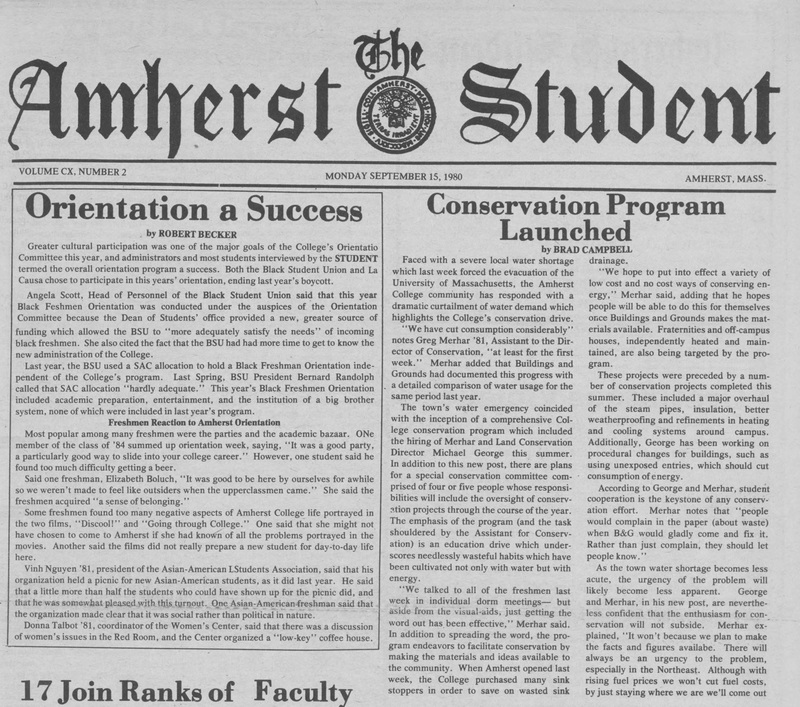 A full run of the newspaper is available to read in the Amherst College Archives & Special Collections. 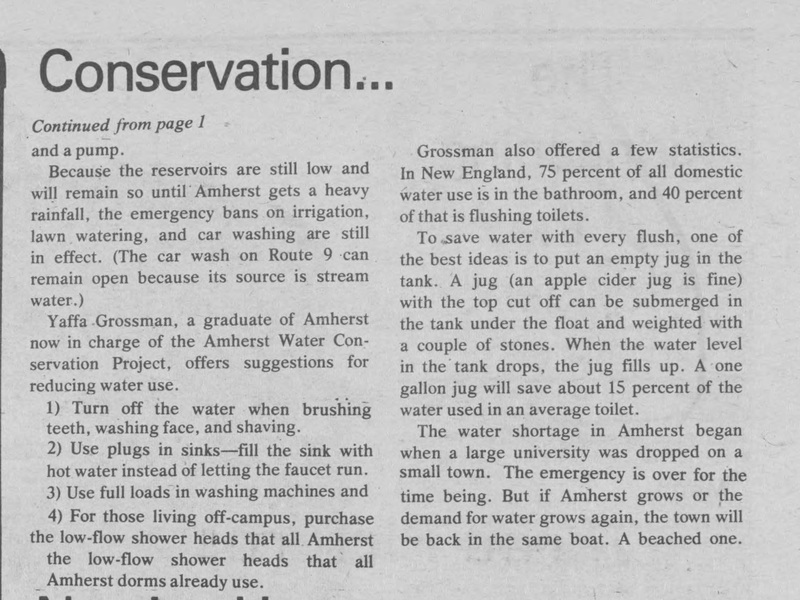 For more information on Amherst College’s ongoing efforts to conserve water and for ideas on how to do your part, visit the Amherst Conserves website. 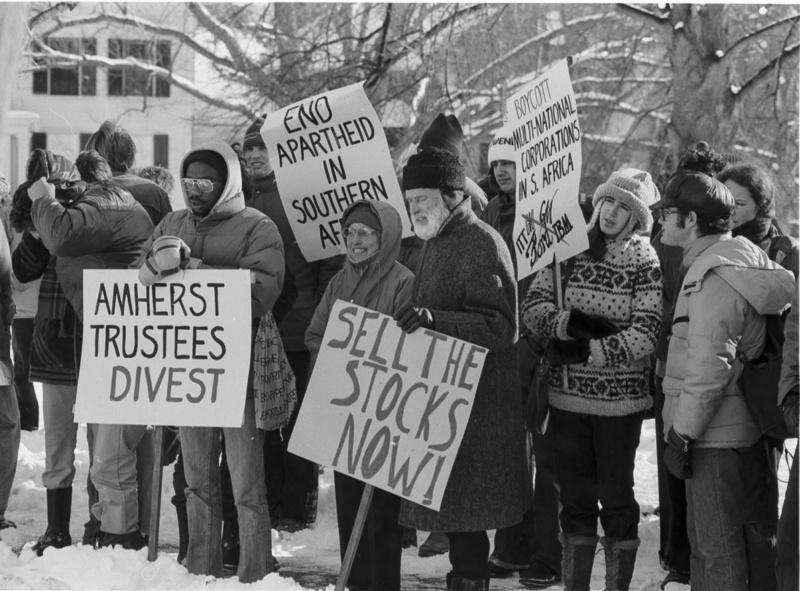 In honor of the upcoming Global Divestment Day urging institutions to divest from fossil fuel companies and the work being done on the Amherst Campus in support of divestment from coal, I thought we should take a moment to look back at an earlier time that Amherst divested its investment holdings on ethical grounds. 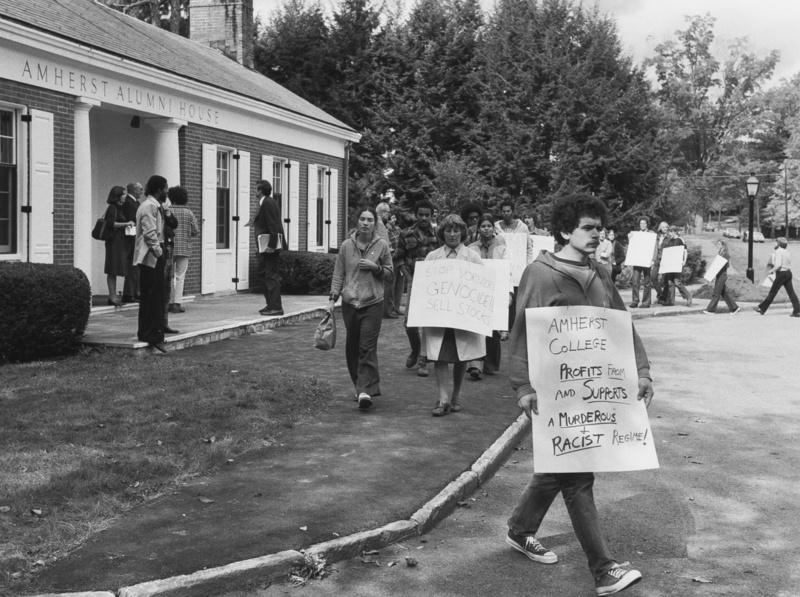 I’m referring, of course, to the international campaign to pressure the South African government to dismantle its apartheid system in the 1970s and 80s (although Amherst also divested from Sudan in 2006 on ethical grounds).